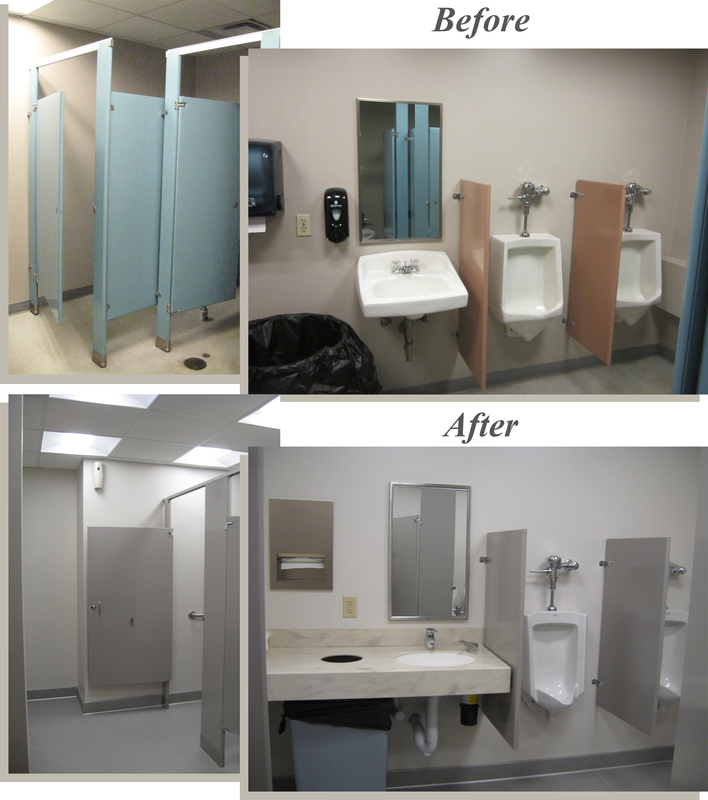 Three i Design recently improved the restroom facilities at the main office. New fixtures, partitions, vanity countertop, lighting, mechanical diffusers, paint, and tile flooring were included in the renovation. This project integrated many of our departments, including Architectural, Electrical, Interior Design, Mechanical, and Plumbing. An aspect we encounter during each project is listening to the many ideas each client has, filtering out the most important information, and interpreting that wish list into a quality design solution, designed to last for decades. Three i was no exception to that. Various employees provided feedback and suggestions throughout the design process, and we assembled that feedback into project that exceeded expectations. The restrooms were dated in design and had dim lighting; it was time for an upgrade. We selected timeless colors with a lighter wall color and higher light levels to provide a modern experience. Every multi-discipline project includes coordination between departments. Three i harmonizes the process with internal meetings and client involvement at every stage of each design project. We want clients to enjoy the whole process as well as the final product, and appreciate when many of our clients return to us for future projects. If you are considering a renovation to your facility, whether it’s just new paint and flooring in a restroom, or gutting an entire building, Three i Design wants to be your partner. We know that finishes and updated colors are the most noticeable portions of a project, and play a big part in employee morale. No matter how big or small your project is, Three i Design will guide you and provide great recommendations to allow you comfort with any sized project. Call us today for a meeting and check out the newly designed restrooms!